Once again, I was a day late, and a dollar short. Things are hectic here at the scoop, and this immensely delayed review is proof (I actually ate this two weeks ago). 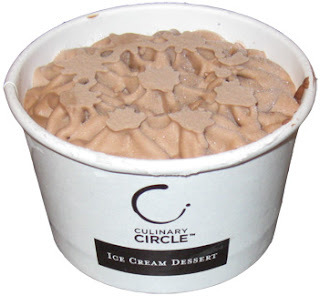 I had been saving this final Culinary Circle treat for a special occasion, but instead the poor little guy sat in the back of my freezer (one of the two cups got damaged in shipping, so rather than plowing through one and then saving the other, I just saved the other, thought I never intended on waiting so long). So, first, I apologize to Culinary Circle. I want to thank them for sending me a sample of each of their 8 great new treats. I long assumed the Brownie would be their crowning achievement, how could I not? 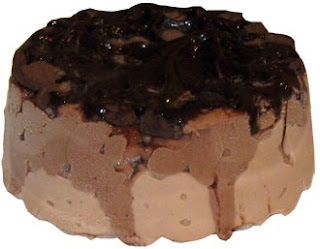 "layered chocolate ice cream and dark chocolate mousse; topped with a chocolate butter fudge sauce and chewy brownie pieces." there's a little bit of freezer burn, but consider it's been inside my fridge for over 2 months. Here is our little friend in the proper eating position (again, mild freezer burn, and again, my apologies to CC). It sure looks tasty enough. I dig in, and it's good, but one thing is bothering me: the cocoa powder on the brownie bits. It made the brownies feel way too dry. It's got quality ingredients like the other 7 ice cream desserts, it's just I got hung up on the brownie bits (they may have also dried out a bit in the freezer, I'm not sure). If I see these on sale, I may give them one more try, just to be fair. Sweet mother of ice cream, that looks good!